When I was a kid, Groundhog Day wasn’t what you might call a major holiday. It had about as much significance as Arbor Day. Come to think of it, I do remember bringing home little saplings from school to plant in the yard on Arbor Day, but we never got free groundhogs. So maybe Groundhog Day was actually at the bottom of the list. But times change, and unless somebody comes out with a really good movie about Arbor Day, I think it’s safe to say that this once disrespected “holiday” can now hold its little rodent head up proudly. 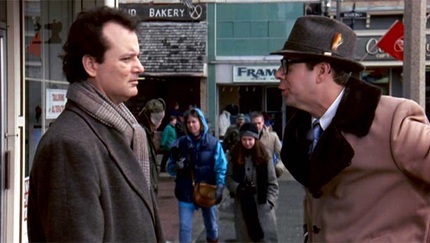 Groundhog Day (the movie, not the holiday) was introduced in 1993. It was written by Danny Rubin and Harold Ramis, with Ramis also directing. You may best remember Harold Ramis as Dr. Egon Spengler in Ghostbusters (which he also wrote), but he also makes a brief appearance in Groundhog Day as a neurologist. Bill Murray plays meteorologist Phil Connors, a frustrated and egotistical TV weatherman from WPBH-TV9 in Pittsburgh who has once again been assigned to cover the Groundhog Day festivities in Punxsutawney, Pennsylvania, home of Phil, the groundhog. He is accompanied on the trip to Punxsutawney by Larry the cameraman (Chris Elliott) and a new producer, Rita (Andie MacDowell). The event lives up to Phil’s low expectations, and he can’t get out of town fast enough after taping his segment. The winter weather takes an unexpected turn for the worse, however, and the trio finds themselves stuck in Punxsutawney for one more night. But for Connors, it’s the longest night of his life. For reasons unexplained, when Phil wakes up the next day, the next day is yesterday, all over again! Somewhat disoriented, he heads to the groundhog ceremony, having eerily familiar conversations and interactions along the way. When the same weather pattern traps them all over again, Phil warily goes to sleep and then awakens to the exact same Sonny and Cher song on the radio. February 2nd again. And again. And again. That’s the whole movie. Well, it’s not really the whole movie, because while the day keeps repeating and nobody is aware of it but Phil, his actions and attitude are constantly changing as he is desperate to break the painfully predictable routine of reliving the same day over and over again. After the initial shock, the monotony becomes unbearable for Phil, and he begins to explore ways to exploit his situation, taking advantage of the locals to satisfy and gratify himself. Soon enough, he tires of this, as well. Even ending his own life doesn’t actually end Phil’s life, and he seems doomed to duplicate this day forever. Groundhog Day is a tough trick to pull off, with endless variations on the same scenes, but Ramis and company pull it off well. Murray manages to be smarmy and obnoxious and charming and despondent and hilarious, sometimes all at once. And one of my favorite performances comes from Stephen Tobolowsky as Ned Ryerson, an old schoolmate of Phil’s who now sells insurance, and he successfully steals more than one scene from Murray while somehow making us enjoy every moment he’s on screen while simultaneously wanting to punch him in the face. Weird, I know, but very funny. Anyway, the film follows Phil’s journey of self-discovery, painfully hilarious as it is, until he finally finds enlightenment. And that’s not a spoiler, by the way. It’s actually a relief to know there’s a happy ending, or after the 50th time or so of hearing Phil’s alarm clock radio play “I Got You Babe,” you might just turn off the DVD and step in front of a bread truck. Don’t; you’ll wanna stick around for the end of the movie, which manages, somehow, to be charming and funny and teach some profoundly simple but essential truths about how life ought to be lived and what ultimately brings real peace and joy.